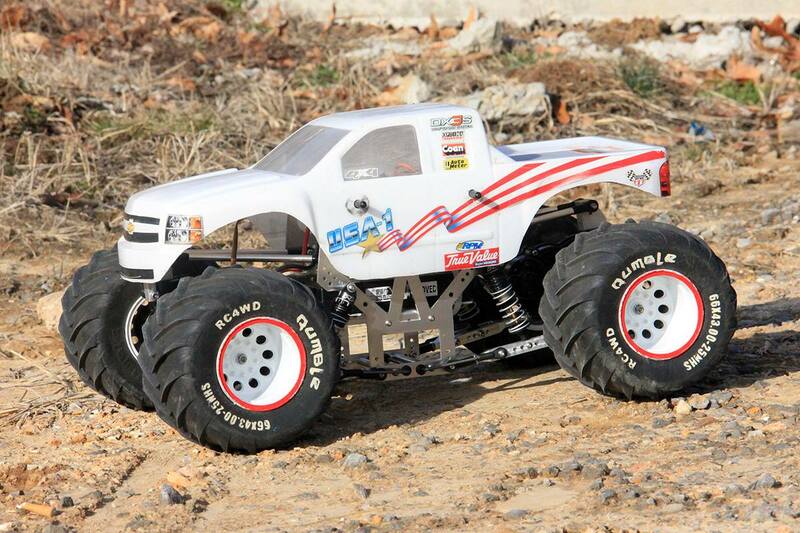 Monster Truck Madness – Sassy Looking Chassis « Big Squid RC – RC Car and Truck News, Reviews, Videos, and More! When many of us build new monster trucks, it’s only natural to focus the cosmetic attention of the build towards the body. The body gives a monster its identity, after all. That’s whether it’s a giant snake, a super-hero or just a simple Chevy pick-up. Not enough attention gets paid to how the chassis looks. And by chassis, I’m also extending that to 4 links and sway bars as well. Nothing ruins a killer paint job like an unpainted or (worse) mis-matched chassis color. It’s easy to neglect finishing the chassis because unless you do it from the start while it’s still in pieces, a full tear down and deep cleaning of your vehicle is required. I don’t mean to just throw others under the bus as I’ve been as guilty of this as anyone. The USA-1 seen at the top of the article was a build I did several years back. I “mocked up” the chassis and before I knew it, it was a roller. I then kept adding parts until it was a runner. Then I said eh, screw it. Too lazy to take it back apart. Would’ve looked a lot better with a black chassis though! And while I’m primarily talking about machined aftermarket setups, box stock guys aren’t out of the woods either. If you are running an SMT10 neon-green Grave Digger chassis….it’s not going to look so good with, say, a BIGFOOT body or something else that doesn’t incorporate the color on it. Ok, so let’s say you have a fresh chassis ready for some color…what do you do? There are several choices. Let’s start with plastic, because I know a lot of folks modify their SMT10’s or in some cases just buy the naked chassis and start from there. If you have the aforementioned neon green one, it takes darker colors of Rit dye pretty well. Black is definitely easiest, but you can accomplish other colors by experimenting. Use one of the small cage parts for a test to see if you can get the color you want. Worst case you can always go black! The SMT10 cage also takes paint well, in which case you can follow the steps below for aluminum. Tamiya TS paint is my choice for standard aluminum chassis. They have various primers in the same formula and once you prime, paint and clear it, you’ll have a great finish that should be somewhat resistant to the standard scrapes a monster truck is subjected to. You can also go cheaper and use Krylon or some other material specific spray paint, but I’ve found that those can go on so thick that sometimes the end result looks crappy. If you do plan to use standard, non hobby paint, let me recommend tractor paint. Head into your local agricultural store and snag whatever color you need. Once you spray it, let it set and cure for a long time. That stuff usually holds REALLY well, as it’s designed for field equipment out in the elements. Again though, just be aware that it can run if you aren’t careful. The ultimate solution is taking your chassis to get powder coated. For the uninformed, powder coating is a process in which electrically charged particles are bonded to a part. It results in a fantastic looking final piece that’s remarkably durable. It takes some serious abrasion to mess up a powder coated chassis. Your best bet for this is to call around and find a local shop to do it for you. It can range in price from between $35-$75 to have it done, but again, the result will be a professional coat that should last the life of your monster. If you can find someone to do it in the color you want, I’d do it. Regardless of what method you use or who you have do it, get that chassis painted! It can really make (or break) the build.